Fancy guppies are one of the most popular, easy to keep, hardy and lively ornamental fishes in the fish keeping hobby. After the discovery of million fish and after its introduction in to United States, first successful attempt was made in developing double sword tails in 1930. Selective breeding was taken up by pet enthusiasts in 1950s and Paul Hahnel, was one of the pioneer in development of new strains of these ornamental fish. Coffer tails can be considered as the first fancy guppies. They were developed by W. George Phillips of Britain who later on developed the English Leopard (English Lace) which are the forerunners of almost all the snakeskin varieties. From these, Eduard Schmidt Focke developed half black tails. Breeding these ornamental fish with specialised techniques has brought them far away from the phenotype and genotype of wild varieties. Presently they hardly resemble the wild ones. Now the emphasis is on getting ornamental tails such as spear tails, round tails, sword tails, lyre tails and delta tails. The breed name and classification of these ornamental fish is not consistent and differs between and within countries. With a new breed or strain being evolved every day a semblance of uniform names and identities is becoming difficult. Now that national and international level breeder associations and clubs of these ornamental fish have come up we may expect that the classification will be put into an order. With excessive inbreeding the genetic and reproductive vigour of these beautiful ornamental pets is diminishing and this problem has to be looked in to. Quite often you will read that the fancy tails are peaceful, mix well with other ornamental fish and are great community fish. It is true and they are harmless to other fish. However with the big tails their movement is slow when compared to common guppies. Other community fish may peck and nibble at the fancy tails. You may have to take into consideration the temperament of the other ornamental fish in the community tank before introducing them into a community tank.Otherwise you may have the tails injured and torn. If you are also keeping females of these ornamental fish then it will be better to have two or more females for each male so that the females may not get harassed much. With good quality of water, proper feeding and timely water exchanges, these ornamental fish can be raised easily and they may live up to two years. Breeding of fancy fish is easy but for developing show quality champion fancy guppies, it requires dedication, years of experience and understanding to select the perfect breeding pair. To start with, finest and quality parents are required. Starting with fancy guppies from pet shops and other sub-standard ones, no doubt you may get average specimen but not champions and high value fancy guppies. 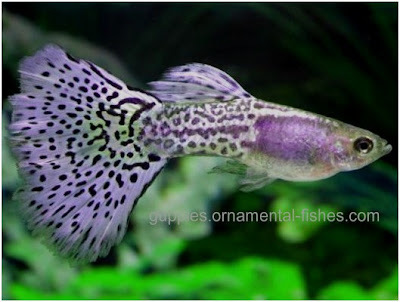 that has to be the prettiest guppie ive ever seen, do you ever sell these?